1879: Actual Play: Repel Boarder! – FASA Games, Inc.
1879: Actual Play: Repel Boarder! In our last episode of Actual Play, Thierry, the party’s Byron, followed the money from Otto von Schmerz to Eduard Egon, Landgraf von Fürstenberg-Weitra. Why does an Austrian nobleman want Zener tubes, and why that particular set? Poor Anatole is still recovering from the wounds von Schmerz left him with, and the loss of the tubes, and the wrath of a cafe proprietor whose premises were despoiled. Our heroes have agreed they must follow the trail and see what may be found at the source. Sam Ridley, captain and pilot of Sweet William, has pointed his ship south-eastward, setting a course for Dresden, Prague, and eventually Wien, crossing two borders and rather a lot of unwelcoming terrain. Leaving Prussia for Bohemia poses a few difficulties. Our heroes need to make a quiet exit, which means no official records, which means no stop at the border crossing to get papers stamped and record Sweet William‘s registration. Given the tendency for both the Prussians and the Czechs to take potshots at anything traveling outside the approved lanes, Sam has elected to swing to the east, and make the crossing through the Elbe Mountains, relying on the dense old-growth forest to prevent ground-based annoyance with his ship’s presence. He’s forgotten about the wildlife. The night after leaving Dresden, the last airfield where they could reasonably expect to top up their fuel and acid supplies with a few extra marks in the right hands guaranteeing no awkward questions, our heroes drift slowly and quietly through the low sandstone peaks of the Elbe range. Sam has made a Pilot Airship (12) Test to line Sweet William up with the prevailing winds, requiring only a nudge on the throttles every now and then to keep the Giffard on the right course, ghosting along silently with only the creak of ropes. It’s all very nautical and romantic, up until the gryphon attacks. Sam has no trolls among his crew, for tolerably obvious reasons, and no dwarves either, so he hasn’t got anyone with heat sight. While his engineer, Coby, is a snark, she’s below decks in the engine room, babysitting the microsteam engine, which isn’t being at all happy about this on-again, off-again nonsense. There’s nobody on deck who could easily spot the beast. It’s been clever enough to make its approach from behind and above the Giffard, using the gasbag as cover. The first indication of trouble is when the GM asks the players to roll Initiative. They all sigh, and reach for their dice. And the trip was going so well up till now. On 18, the gryphon splits its movement, using half its Movement for the attack, and makes an Aerial Combat Test with a result of 10 to roll down around the gasbag and strike at the starboard gunner. Trifin lets out a round Breton oath as the gryphon, with an Attack Test (8) result of 9, tags her with a claw, but its Damage Test result of 7 barely puts a scratch through her heavy leather air crew jacket. The other claw Attack Test, against Trifin’s Physical Defense of 8, fails with a 7, and the gryphon uses the remaining half of its flying Movement to get some distance. On 13, Bethelie draws a pistol, but by that point the gryphon is out of range. She uses the rest of her turn (drawing the gun being a Simple action and allowing another Simple) to take cover by an equipment locker close to the rail. On 12, Sam goes for Superior Positioning, a vehicular combat Maneuver. 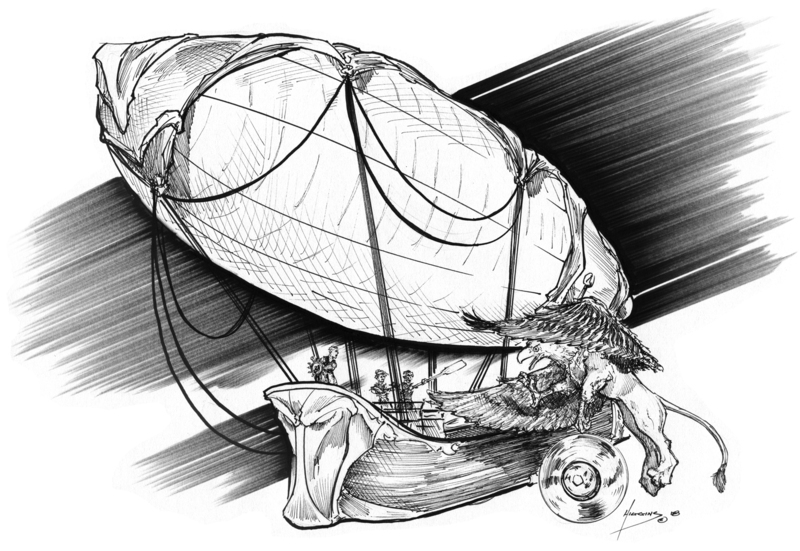 He makes a Pilot Airship Test against the gryphon’s Physical Defense of 10, and gets a 17, gaining +2 Steps per success for a total of +4 Steps for his crew to act against the enemy. Sam leaves the port throttle at half speed, where he’d put it for the turn, and brings the starboard throttle up to half as well. The noise can’t be helped, he’s got to get headway to deal with the attack. On 9, Dughall Speyer, the port gunner, leans out on the railing to sight as he traverses his gun to its full extent, bringing the gryphon into his sights. He squeezes off a three-round burst from his Maxim, and rolls a 27 on his Firearms Test. That +4 Steps from Sam has made a difference already. That gives Dughall a Base Damage of 10, a staging of +15 Steps for the three extra successes, and a staging of +10 for the second and third rounds, for a total of Step 35 for the damage. He rolls a 29 for his Damage Test. The gryphon takes 25 points, after subtracting its Physical Armor of 4. That’s a Wound, and a Knockdown Test against a 14. With a Knockdown Step of 8, the gryphon rolls a 7. Its wings fold and it plummets. Trifin spends her Initiative setting her Maxim to full auto, and making sure she’s ready in case that damn thing comes back for another pass. Thierry, who had rolled a 1 on his Initiative, casts about for something suitable as a weapon, as his pocket pistol isn’t any good past a range of about four paces. As the echoes of Dughall’s burst die away – well, everybody within a mile knows there’s someone with heavy firepower in the neighborhood, so much for that – the party rolls initiative, and the GM rolls for Sam’s GMC crew members. On 14, Sam throttles back to half, and eases the ship back around toward its original heading, hoping to still make an exit from the area without the border patrol intervening. On 12, Bethelie holds her action. She’ll get a chance to interrupt later in the round if anything happens. On 11, the gryphon, having learned a painful lesson, attacks from below, grabs the railing with one foreclaw and rakes at Dughall with the other. With an 18 on its Attack Test against Dughall’s Physical Defense of 9, it’s just short of two extra successes, and stages up its Damage by +1 Step. It rolls a 25. Dughall is laid open like a Christmas goose, taking 20 points of Damage, a Wound, and rolling a Rule of One on his Knockdown Test. He’s flung up against the Kipp, and collapses, bleeding and dazed. The gryphon snaps at empty air, having no target for its beak attack. Bethelie turns and snaps off a shot, getting an 11 on her Firearms Test. Her d10 explodes and she gets a total of 19 on the Damage Test, doing another Wound. The gryphon rolls a 12 on its Knockdown Test, even with the -1 Step to all actions its second Wound is giving it, easily beating the Target Number of 8. On 8, Sam pegs the port throttle, hoping to shake the beast loose from its grip on the rail. Sweet William groans as the gondola pushes the gasbag around hard, straining the rigging. The gryphon, though, holds fast. And tumbles into the propeller. The border between Bohemia and Austria is perhaps a bit more porous, although not as much so as one would expect for a kingdom that is effectively a province of an empire, and the empire that owns it. This is fortunate, as Sam really doesn’t want to have to explain the blood splatters across the side of his hull, or why his port engine is still spitting out occasional puffs of black smoke from carbon fouling. A water landing, to wash off the hull, and a day of repairs at a dockside facility are in order. And a round of drinks for the Byron, who’s getting a crossed wing and oar tattooed on his left bicep. Gryphons take no penalties to sight-based Perception Tests regardless of distance. If the target is within line of sight, the gryphon can see it clearly. The second Movement rating is the gryphon’s flying speed. These four-legged creatures combine a lion’s body with the head and wings of a large eagle. The gryphon’s front legs are covered in feathers and end in sharp talons. Its hind legs are properly leonine, covered in soft fur and ending in paws. The gryphon stands twelve hands at the shoulder, is five to six feet long, and has a wingspan averaging twenty feet. It may be found anywhere in the British Isles and northern Europe, although not as far as Scandinavia, being somewhat averse to the deep cold. Gryphons make their nests in the mountains, the steeper and more craggy the better, and generally act very much like horse-sized birds of prey. While theoretically the gryphon could be tamed and used as a mount, thus far attempts to do so have resulted in breakage and bedlam, more than a few maimings, and several fatalities. Gryphons actively resist most techniques used in breaking horses and other land-based mounts. Falconers who have been consulted have suggested raising the gryphon from a cub, the way a falcon or hawk is raised from an egg. Some experiments in this are under way, mostly by the military of Britain and Prussia, who have the resources for such long-term efforts. Consultations have also been held with Saurid hapatvnorefvar, in hopes that the techniques they use to tame and ride the pteranodon-like creatures of the Gruv might be useful. Not much has come of that as of yet. Of especial note is the fact that gryphons cannot be stabled near horses. One simply does not put a massive predator where the horses might smell it on the breeze without causing the aforementioned breakage and bedlam.